Maharashtra Tourism Development Corporation (MTDC) participated at the recent PATA Travel Mart 2018 in Langkawi, Malaysia to promote the tourism prospects of Maharashtra on a global platform. Dinesh Kamble, Senior Manager, Marketing and Publicity represented MTDC at PATA Travel Mart 2018. MTDC pavilion at PATA Travel Mart 2018 was visited by Mridal Kumar, High Commissioner of India to Malaysia and Sudeshna Ramkumar, Director – India Tourism Singapore, Ministry of Tourism, Government of India along with Chris Botrill, Chairman, PATA and Mario Hardy, CEO, PATA. 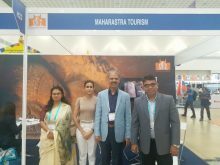 Maharashtra Tourism Development Corporation (MTDC) showcased several prospects of tourism such as beach tourism, Buddhist tourism, adventure tourism, wildlife tourism and Bollywood tourism at the 41st Edition of PATA Travel Mart 2018. PATA Travel Mart 2018 offered a golden chance to aggressively market the tourism catalogues, vivacious culture, exclusive destinations and investment prospects in the state.